Are you looking for maintenance utility vehicles for urban maintenance? Are you looking for vehicles for landscaping? Do you prefer snow ploughs? Do you no longer want to collect refuse in the morning when tourists are around? Do you need a silent vehicle that lets you do it undisturbed during the night? Alke' offers a wide range of maintenance utility vehicles that can be customised for the upkeep of public spaces. The ATX are small but very powerful, versatile and ecological maintenance utility vehicles that simplify the handling of the most common public operations. Their main use is in the care and maintenance of public green spaces where they can be used for watering, treatment, the collection of leaves and putting on fertilisers, and also for maintaining roads, where they are used in winter as snow ploughs and gritters. They are also widely used for normal and green waste collection, and for collecting branches. Because of their small size they can also be used on bicycle paths and in corridors inside sports structures. Public parks are places where people love to meet. Maintaining and irrigating them is a process that requires time, care and commitment. With the ATX230E it is possible to easily take care of public gardens and parks while fully respecting the environment. 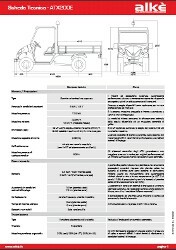 The vehicle used by municipalities and public bodies for maintaining green spaces is completely electric has been designed to meet all requirements and easily reach any area, even the most uneven surfaces. Thanks to its small size and the smooth and precise steering, the ATX230E provides high levels of performance, is easy to drive and extremely comfortable thanks to the passenger compartment that has been designed with its occupant in mind. However we should not be fooled by its small size, the ATX230E can be equipped with a tank that can hold up to 600 litres of water and an electric pump for delivering the water with a power of 500W. Because of its technical and structural characteristics, its robustness and manoeuvrability, the ATX230E is the best tool for maintaining and watering public green spaces. Completely electric and ecological, it has a range of 75 km and a full recharging time of 8 hours. The ATX are very powerful maintenance utility vehicles that can deal with gradients of up to 35%. Combining these characteristics with the specially designed snow plough blade, and a vehicle width of just 127cm, Alkè has created the ideal vehicle for shovelling snow both in cities and in the most difficult to reach mountain areas. The ATX can operate in severe conditions to clean roads, bicycle pathways, pavements, easily reaching areas that normal electric vehicles could not reach. The snow blade Kit can be used on Alke' ATX maintenance utility vehicles and comes with a salt spreader module. 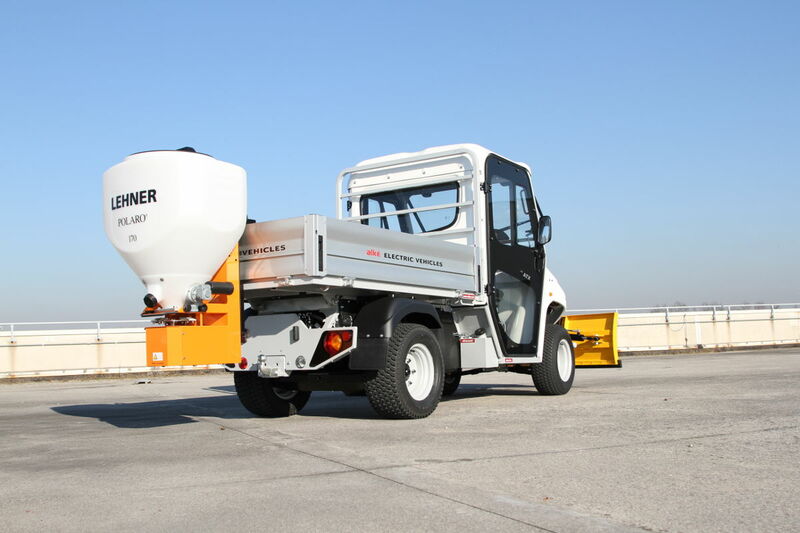 The salt spreader has a capacity of 170 litres e and can be assembled and disassembled very easily (the operation requires no more than 3 minutes). There is also an electric control in the cab for adjusting the jet. 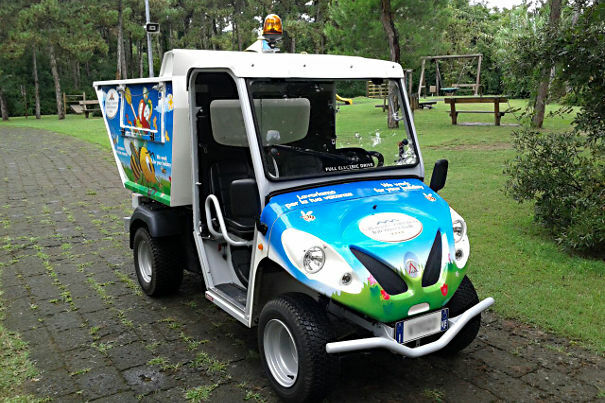 In summer the vehicle is a valid ally for maintaining roads, collecting waste, the transportation of goods and the upkeep of green spaces. Waste collection body with zero emissions can also work at night! 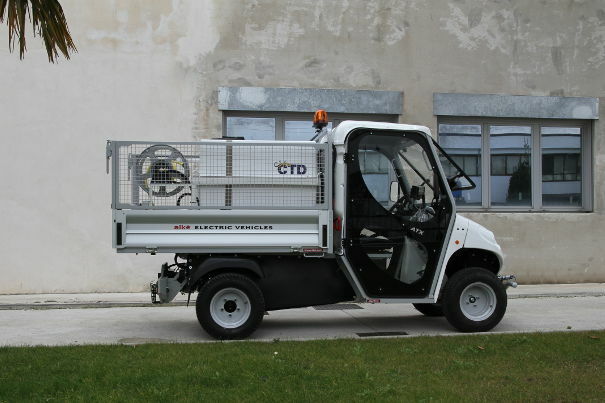 The ATX210E, ecological and silent, are ideal vehicles for collecting waste in urban areas. In fact, unlike diesel or petrol vehicles, they can easily be used in population centres also during the night without creating any noise to disturb the residents. Designed for municipal companies, camp sites, holiday villages and old town centres, they are ideal vehicles for the disposal of waste. Unlike a normal vehicle, the ATX210E do not feel the effects of repeated stop and go thanks to the system for the recovery of the braking energy. The system, in fact, allows the engine to be transformed into a dynamo generating energy that is transmitted to the batteries. The ATX can be converted into miniature trucks thanks to the fully removable steel mesh sides. The steel mesh sides transform the vehicle into a real truck for transporting any type of material like branches, sheets, sacks, and industrial products. The rear drop side also has compass opening, making it easier to load and unload goods. 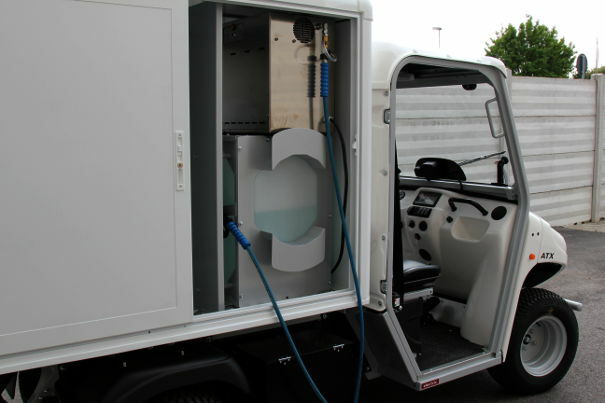 Alkè provides a wide range of solutions for managing and maintaining public areas in towns. Each vehicle is certified and type-approved to drive in private areas as well as on public roads. 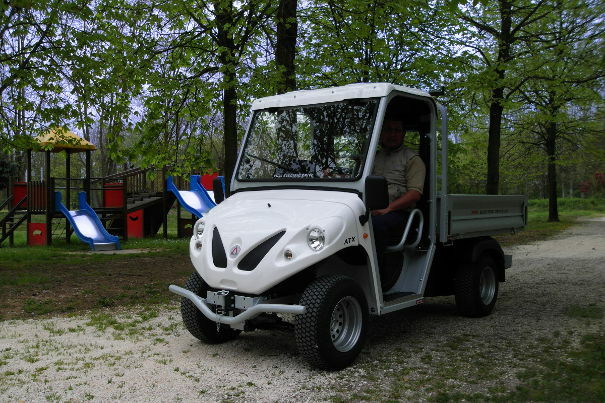 Ask for the prices of the Alke' maintenance utility vehicles! Snow blade for ALKE' vehicles with controls inside the cab for tight streets, bike paths and footpaths.